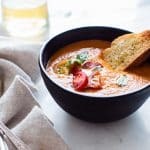 Hearty and rich with just 5 ingredients in this creamy Roasted Red Bell Pepper and Heirloom Tomato Soup. Freeze with ease to preserve for winter days ahead. 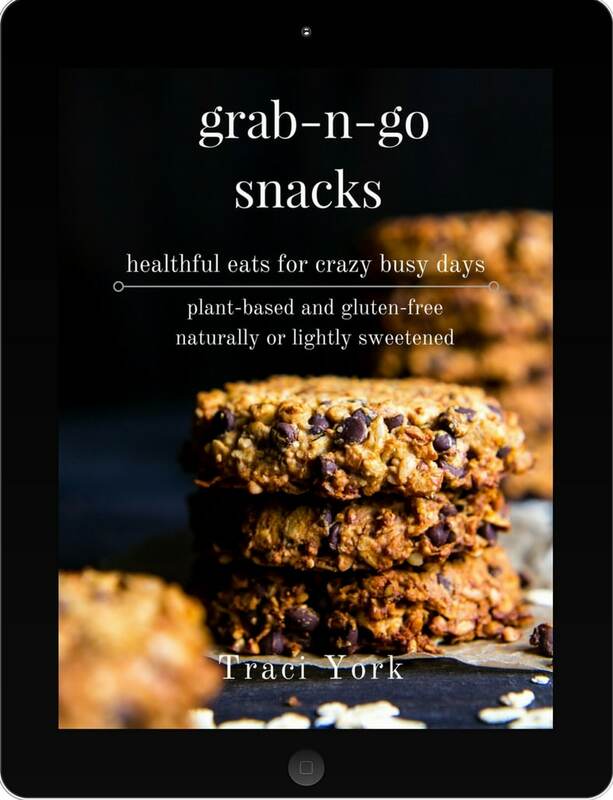 gluten free + vegan *Recipe updated Sept. 2018 with new pictures, text and a few additional recipe notes. Looks almost like pumpkin, doesn’t it? I haven’t quite jumped on the pumpkin train yet, although, I am eye’n those beauties and am looking forward to Fall flavors. There are still heirloom tomatoes to be had and bell peppers continue to make their appearance at farms and markets. Thierry Rauteureau, an award-winning Chef and restaurateur from Seattle hosted a cooking demonstration at a conference I attended several years back. 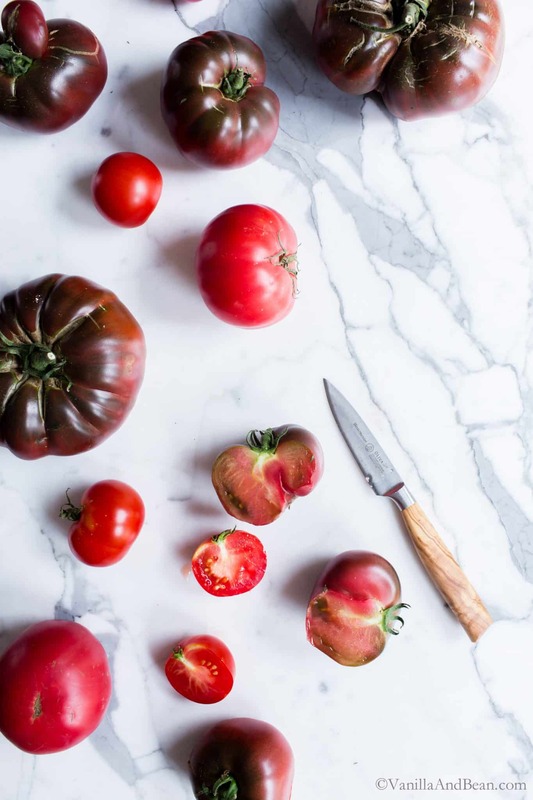 It was this creamy tomato soup recipe he shared that made me look at heirloom tomatoes in a different way. I’d never considered cooking them since they’re so delicious raw. But he showed me how to prepare them simply, allowing their juicy and fresh flavors to shine. Making tomato soup from scratch is so simple and a recipe everyone should have in their back pocket. Adding a few roasted red bell peppers to an already creamy tomato soup creates an even richer, a little sweeter soup. And just look at that color! 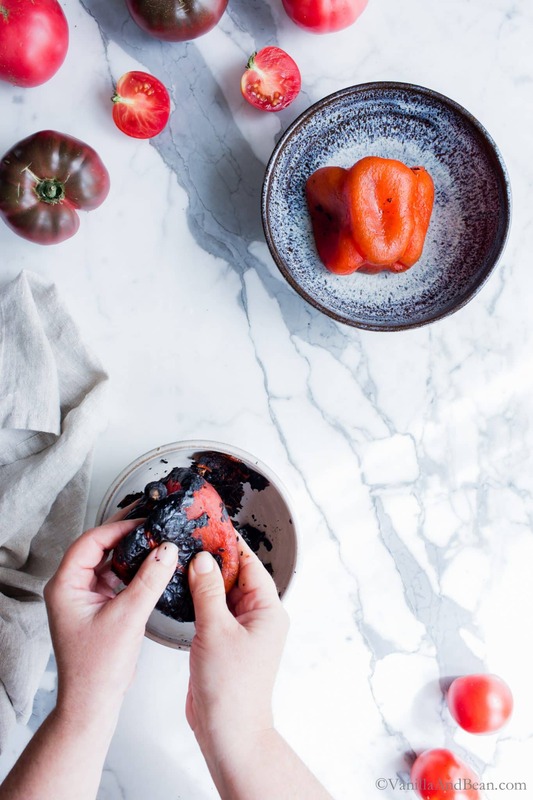 Start by roasting the red bell peppers either on a gas flame or in the oven. Meanwhile, cook the tomatoes in a bit of olive oil on the stove-top and toss in a few leaves of basil. The tomatoes can also be roasted in the oven if desired. Once the peppers are charred, steam them for about 15 minutes, then peel the skin and remove the stem and seeds. 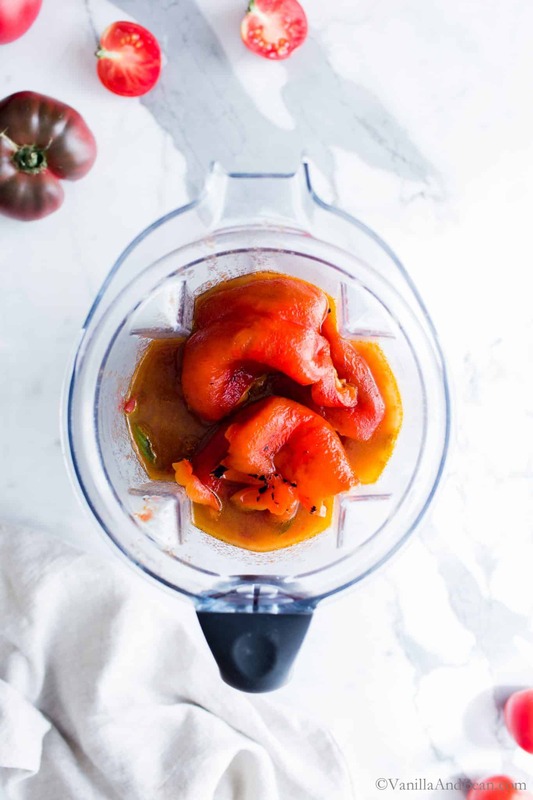 Toss the peppers and tomatoes plus all their juices in a blender. Blend, then drizzle in olive oil to make the soup extra creamy. Toss in a bit of salt and fresh ground pepper. For the tomatoes, I use what I have on hand. Usually a mix of heirloom, cherry and/or stupice. Just be sure to squeeze in at least one large heirloom. Their flavor is worth it. 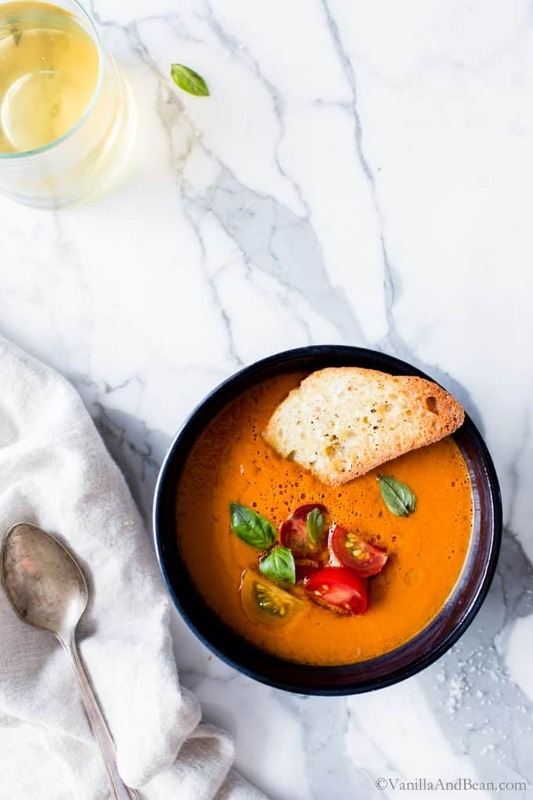 This creamy tomato soup recipe can be enjoyed as a main with a big salad, Almond Sage Pesto Grilled Cheese, crusty bread or serve as an appetizer. It makes a gorgeous starter for Thanksgiving. One of the keys to making this soup extra creamy and rich is the process of creating an emulsion while the olive oil is being drizzled into the blender. Heat and motion help create this culinary wonder. Freezer friendly? Yes please! I’ve stored this soup in the freezer up to five months with good results. It was a cold January day when I pulled that frozen jar from the freezer. Just be sure to thaw in the fridge overnight and give it a good blend in the blender to re-emulsify. Oven Roasting Peppers: Preheat oven to Broil. Place the peppers on a sheet pan and char large peppers for about 15 minutes rotating every 4-5 minutes so that all sides are blackened. Minis take less time, rotate about every 3 minutes. 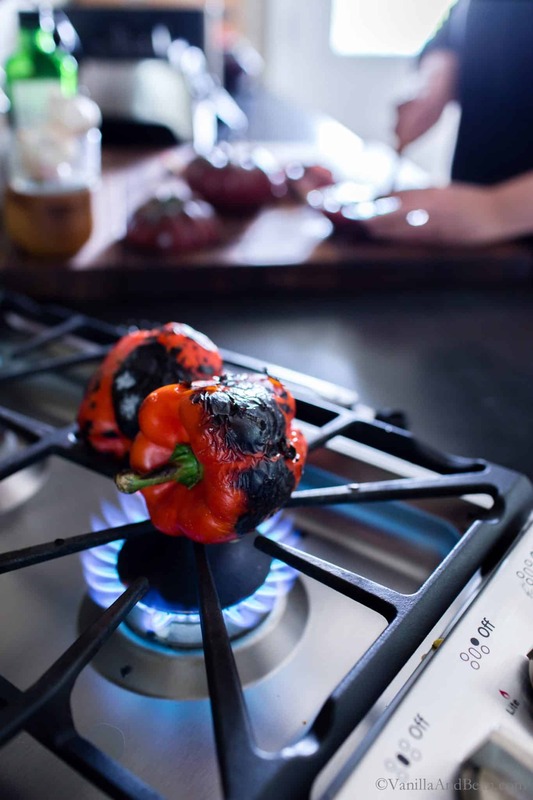 Stove Top Open Flame Method: Place the peppers on the grate over a medium open flame, using tongs to turn the peppers as they char. Getting them good and blackened. You'll need to make sure to stay with the peppers the entire time while roasting. This takes about 10-15 minutes. The peppers should be charred on all sides when finished. Place in a bowl and cover for 15 minutes to steam (this will help the skins come off with ease). Peel, remove the stem and deseed. If the seeds are sticking, gently run the pepper under a stream of water. Slice the peppers in large chunks and place in a high speed blender, I use VitaMix. Meanwhile, destem and cut tomatoes into large chunks. In a large skillet, add 1 Tbs of olive oil. Heat on low, then add the tomatoes and basil leaves. The tomatoes need to be softened and heated through, for about 10 minutes. Stir occasionally. Alternatively, the tomatoes can be roasted in a 425F oven for about 35 minutes. Pour the tomatoes in the blender with the bell pepper. Place the lid on, leaving the steam vent plug off. Hold a thick towel, folded several times, over the vent as to let some steam escape while blending. Starting on low, increase the speed of the blender to medium high. Puree' the tomatoes and bell peppers for about one minute on medium high speed. Turn the blender down to low and slowly add the olive oil. Add the sea salt. Turn back up to medium high and puree' for another minute or until desired consistency. Water can be blended in to thin the soup if needed. Taste for seasoning adjustment. Garnish with a drizzle of olive oil, diced tomatoes and ground pepper. Refrigerate in a lidded container for up to three days or freeze for up to five months. To freeze, pour in lidded jars and allow to cool in refrigerator. Transfer to freezer for storage. 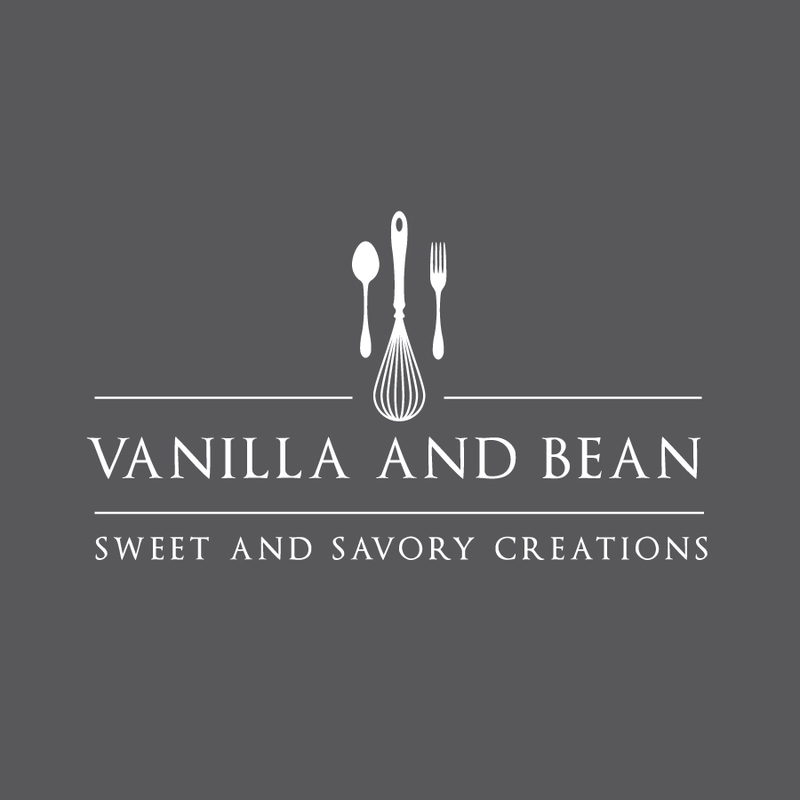 If you make this recipe, or any others on Vanilla And Bean, be sure to post it to Instagram, notify me @vanillaandbean and tag #vanillaandbean! I’d love to see what you’ve made! Also, if you like my content, please consider sharing it with friends and family. Thank you! Loved this soup and so easy to make. I used some last-of-the-farmers-market peppers and tomatoes and the last of the basil from my garden. So a sad farewell to summer, but a delicious ending! Great recipe. Hi Suzanne! Thank you so much for coming back and leaving a note! I love how you’re using up the last of your basil and saying farewell to summer. What a lovely way to embrace the seasonal change! This soup sounds delicious, and I’m loving the short ingredient list! A good tomato soup is one of my all-time favorites. It’s super easy, Nicole! One of my favorites too! This is so perfect for a fall day and such lovely flavors! Made this today. SO quick and easy and really wonderful flavor. Also made this today. Roasted 2 huge tomatoes and 1 huge red pepper on broil. So easy! Just peeled and seeded pepper, only cut stem off tomatoes and blended the whole thing as directed. Basil almost going by so glad to use it. Will freeze. My husband loved the taste test- especially since ingredients came from his garden! Thank you for your note, Mary! So happy to hear you and your hubs were able to use garden ingredients for this soup! That is the BEST! I love how you roasted everything in the oven and will be enjoying this soup well into winter! So happy to hear Sharon! Thank you for coming back and leaving a note! Such a great transitional recipe! I use that emulsion trick with the olive oil with a gazpacho recipe and it makes the soup so luscious. My kitchen is pretty much all packed up for a bit of a renovation starting next week but this soup sounds like a great thing to have on hand while the work it being done. I’ll have to squeeze in making a batch before Monday. Thanks for the inspiration! Good luck on the 29th…sounds like a fun event! Mmmm that gazpacho recipe sounds fabulous.. I’ve not made gazpacho this season (and why not??). OH what an adventure, Jean! I hope your renno is going smoothly and you are creating your dream kitchen! I hope you enjoy the soup… and thank you for your note on the 29th! This is the perfect transition soup! 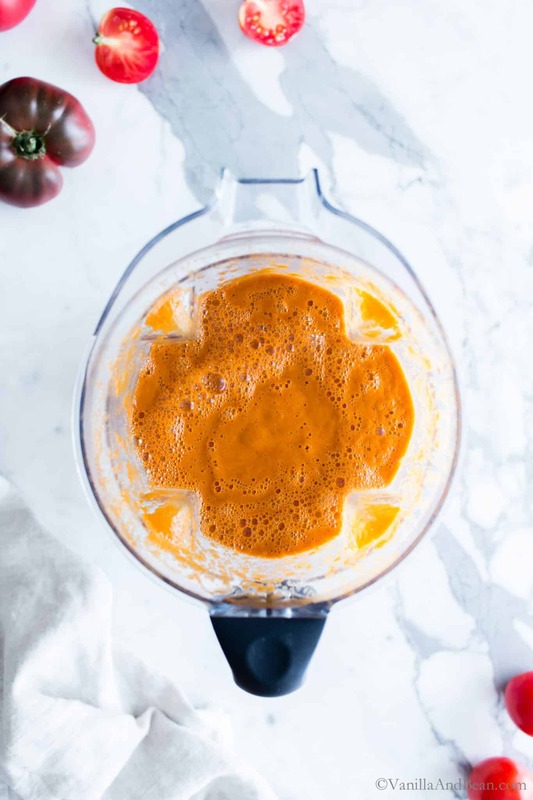 Red pepper + tomato is a favorite combo of mine…especially when grilled cheese is also involved! Grilled cheese FTW! OMGee Liz… I hope to back to my glutenous ways soon!! Wow, just tried this recipe and it came out absolutely perfect! After I roasted the red bell peppers and baked the heirloom tomatoes, I used my Bullet Rx that makes soups. I even added 1/4 cup of diced red onions while it was blending. The consistency was PERFECT. Creamy, light and delicious. Thank you for posting! Especially the details on how to roast the red peppers. Hi Traci! This soup was so delicious!! I recommend definitely adding a little cream. I feel like heavy whipping cream takes soup to a whole new level. And I will prefer to buy crushed tomatoes next time since I made such a mess crushing my whole ones! Lol I will keep this recipe forever. Well I bought about $40 worth of tomatoes and peppers to prepare a course ahead of time for Thanksgiving for 12. I am sad to report my soup is too thin. It tastes great but I think my family will be put off by the soup not being thicker. I did this recipe hoping my blender and Cuisinart would work. No it does let the olive oil form into an emulsion. Any suggestions on how to fix the soup once we unfreeze it? Should we just add some good cream to it? Please help I do not want all of my hardwork, time and money to go to waste. Also how do you suggest to unfreeze it from the jars? I used too large ones which fit about 7 cups each. Ooh, I think this is a good idea! No doubt you would want to enjoy this with your family. How did it turn out? I was looking for a light soup to serve for Thanksgiving and found this recipe somewhere in the depths of the internet. I can honestly say this soup will be a staple in my household from this moment on! I did double the recipe however, using 4 Bell peppers (3 red and 1 yellow) and 8 large Beefsteak tomatoes etc. It is wonderfully smooth and at the same time isn’t too much for a huge turkey dinner. The color is perfect for a fall tablescape or a summer get together outside. I’m glad I found this recipe and will pass it on to all my friends and family. Thanks Traci! OOOH Traci! I made this last night for dinner….. so delish! easy and so wonderfully rich and creamy. My hubby gave it a 9.5. This one will be made over and over in my home…… I can’t wait to try another one of your wonderful recipes! That soup is gorgeous! I love the roasted peppers added to this soup! Pinned! Hi Karen! Thanks so much for your pin and for stopping by! The photos! The colors! I feel like I can taste this through the computer. Just YUM. Oh wow, Carla! Thanks so much! Isn’t food beautiful? So glad you stopped by! I have to say, I’m not usually a fan of bell peppers but you have managed to make them look a lot more appealing. This soup looks truly delicious and I can’t wait to try it! Hello Emanuelle! Thanks so much! Perhaps this recipe will create a new fan of bells!? Roasting them brings out so much flavor. I hope you enjoy the recipe as much as my family and I did. Thanks for stopping by! IFBC sounds like it was such a fun and educational experience! I love this soup and freezing some for the winter sounds like it would be a real treat come January! IFBC was fantastic… the sessions were helpful and it was very well organized! It’s in Seattle again next year too. Oh, yes, freezing. My freezer is so packed. I don’t know why I think I can stuff more in there! There is some wonderful flavor, that roasted veggies bring to soups. This looks delicious! Pinning and will try to make it, since I haven’t made soup in a few weeks :) And I’ve made tomato soup only twice so far. Pictures are beautiful! Hi Mira! I agree about roasting! It takes more time, but the oven does all the work. I just have to plan ahead! This soup sounds right up street! Looks totally delicious! Wow beautiful looking soup! I just love bell peppers, or capsicum as we call them :) It looks so thick and hearty! again ….. stunnung photography ….. detail .. detail .. detail. I can’t believe this soup only has five ingredients and that there’s no cream in it – it looks so thick and creamy! I love how healthy this is and imagine it would be wonderful on a chilly day. I can’t wait to try it out, Traci! Hi Julia! I know, right? I was also surprised with how creamy it was too. But it’s that olive oil whipping up into an emulsion with the tomatoes and peppers in the VitaMix. It’s lovely! I hope you enjoy the recipe, Julia! This soups looks delicious! I love tomato soup and red pepper soup, but I had never try them together. Probably I wil try it soon. Pinned! Oh hi Azu! Thanks for stopping by! I hope you enjoy the recipe and thanks so much for your pin! This soup is so beautiful, Traci! And those heirloom tomatoes, so pretty too! 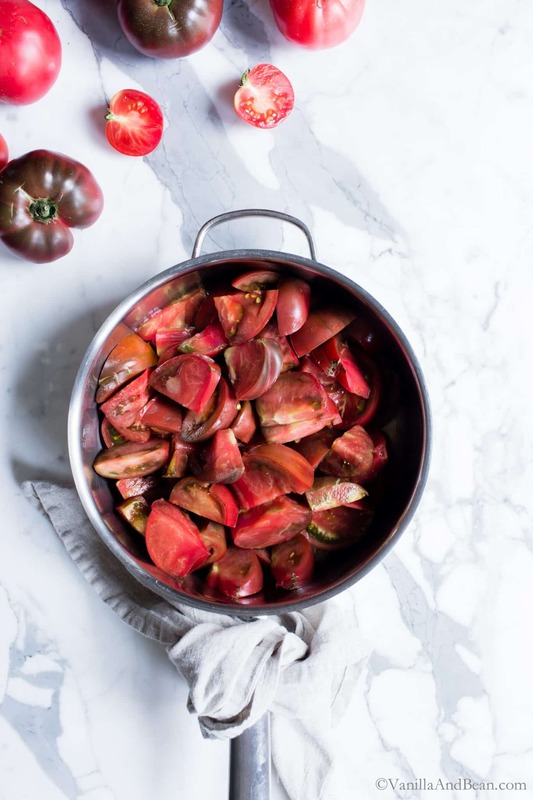 I’m still seeing peppers and tomatoes everywhere so I’m so glad you posted this recipe! It was cold and rained all day yesterday and today and I was so excited to come home and make a big pot of soup! I just wish i would have seen this recipe first :) I always just buy the cheap olive oil ( I probably shouldn’t admit that! ), but I will have to keep an eye out for your favorite olive oil! Hi Izzy! Yeah, I used to by the cheap olive oil too until I tasted the difference! It’s huge! Lucky you… rain. It seems we’re long overdue up here in the Pacific Northwest. I am longing for the rain to return… I hope you enjoy the recipe, Izzy! Send us some rain!! Thank you, Medha! I hope you enjoy the recipe! 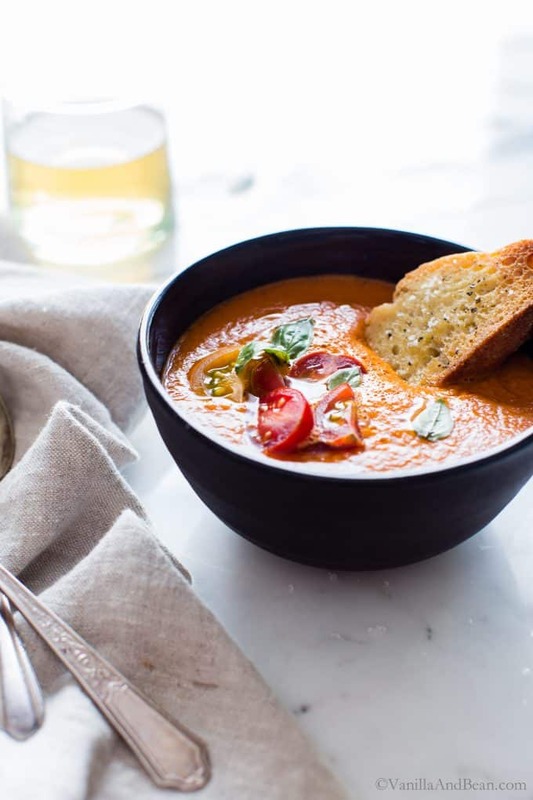 What a perfect combination for soup – red bell pepper and tomatoes! Since it’s been so warm here, I still have some tomatoes growing – I will be making this soup soon. Also, thanks for the recommendation about the olive oil. Love finding a good mild olive oil – some are too strong tasting – so will be giving this one a try. Beautiful photos as always, Traci. We’ve had quite a warm fall, it seems…. or is it just me? How lovely to still have tomatoes growing, Geraldine! I think you’ll enjoy the olive oil. I agree, some are so strong, almost acidic, it just ruined it for me. But not since I found CA Olive Ranch! I DO get the idea! My freezer is so stuffed, I’m borrowing space from my neighbor!! hehe! Soup is better served in a mug… I don’t know what it is about that handle and being able to hold the bowl close to one’s mouth! I hope you enjoy the recipe, Allison! Traci… these photos are GORGEOUS. Seriously, amazing. I even pinned one to my Food Photography board on Pinterest.. and that’s one picky board! I also don’t usually go for a tomato soup, but this one is just screaming my name. There’s something so wholesome yet luxurious about it, rustic yet elegant. You’ve done it again! Awh, thank you, Cheryl! I appreciate your pinning me to your ‘picky’ board! LOL!! It is a beautiful board and I am flattered to be there! I hope you and O enjoy the recipe! Oh my, your soups are always so beautiful, creamy, and full of flavor!